By coincidence, the 1972 and 1973 Venezuelan league #5s both feature Jose Angel Lopez, a Maracay native who also spent 7 seasons in the American minors as pitcher, catcher, and outfielder. Sportswriters made a lot of hay about Albert Pujols' recent shift from 1st to 3rd--wonder what they'd say if he donned the "tools of ignorance" or took the mound. Like many in the lower leagues--Rookie, A, and AA--Jose bounced around throughout his career, going west to Modesto, CA, north to Cedar Rapids, IA, and south to St. Petersburg, FL (career stats at Baseball-Reference). 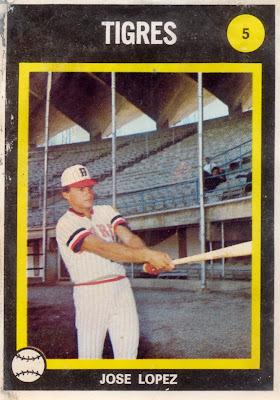 It's not clear how long he played pro ball in Venezuela, but we know he didn't take the field in 1973, as a player strike wiped out their whole season. While this 275-player set (and a collectors album) still reached the market, sales probably suffered from a lack of real games. Value: Bought this at a card show for $5, a good find considering the rarity. Many have back or edge damage, like Jose's upper-left corner.